Well, yeah, I was supposed to be blogging regularly, right? Then life caught up with me, big time, and thus I had to take yet another break. Not so long this time, but still, longer than I was aiming for. However, I have made some major changes, for various reasons, and finally I have been able to scrap for myself only and for noone else. I have resigned from my DT-assignment with Scraplagret, and I have taken a break from the Riddersholm Design team. Why? Well, there are plenty of reasons, but scrapping and creating has never been one of them. I have always been very inspired to create. It's the blogging that didn't really work out for me - it took way too much of my precious time, time that I could have spent creating. I never took the time to create just because I wanted to, and when I was done blogging my assignments I had no energy left for my own blog. So I had to let it go, for the time being. My aim is to be back with Riddersholm again efter Christmas, because luckily, I was persuaded not to resign, but just taking a break. In the meantime, this little fella entered our lives. Meet baby Samuel, my nephew. They just don't make them cuter than this little guy ♥. 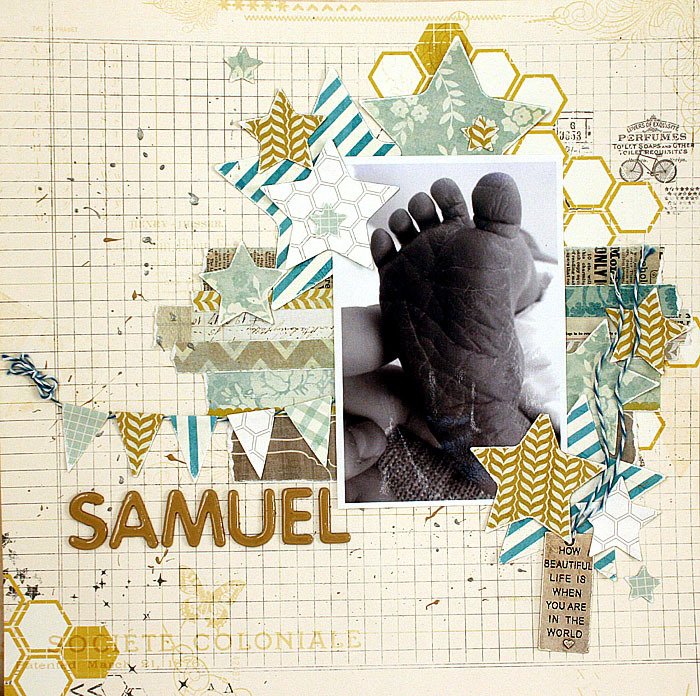 The layout is based on sketch 231 at Creative Scrappers. OK, now, have a great morning, night, or which ever part of the day it is where you are. Myself, I am going to enjoy the rest of this week thoroughly together with my little ones, because we are on fall break right now.